Crackers and Bits — Owls! CJ finally got her new washer delivered— she’s buried in a backlog of laundry, and other human concerns…so I get a second post in a row!! Then she has tons of backlog in the reading of her followed blogs—she’s 2 weeks behind, now! So hang on kids, she WILL be around soon, she promises! 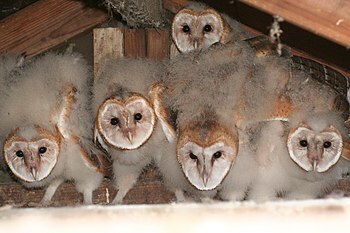 It’s very cute, because of the owlets — C J’s favorite bird family is the owl. What makes it so funny is the narrator’s voice! SO turn up the sound! The voice-over is so much fun, I hit replay, to hear it again, lmao! Okay, so I have more time than …well, LOTS of idle time, I’ll leave it at that. This entry was posted on March 15, 2014 at 8:49 pm and is filed under Animals, Birds, Comedy, Crackers and Bits, Guest Post, Humor, Life, Musing, Nature, Pets, Relationships, Wildlife. You can follow any responses to this entry through the RSS 2.0 feed. You can leave a response, or trackback from your own site. Oh my God, now I can’t breathe. I know! It was a ‘dark fairy tale.’ LMAO! I thought it was pretty funny, indeed. Thanks for stopping to see it. Hope it made you laugh. My Tween used to adore owls and we had them everywhere in the house Mousie. Behind is such an understatement..she’s 3 WEEKS in arrears now! Oh My, up to her eyeballs! Thank you for filling in for C.J. Mousie, I’m sure she appreciates it. I appreciate it too as I might not have seen that very entertaining- and educational- video about the owls who are among my favorite birds. I’m sending whisker rubs for you, would you please pass on hugs to C.J.